You could feel the difference within days, even if you’ve faithfully taken a multivitamin for years! His name is Dr. Walter Crinnion, and his game-changing advance does for multivitamins what the jet engine did for aviation. It ushers in a new era overnight. It takes the multivitamin concept out of the dark ages – where it has remained fundamentally the same ever since the first multivitamin was produced some 80 years ago – and makes everything else that came before it obsolete. With over 30 years as a practicing physician, Dr. Walter Crinnion is considered one of the foremost experts in the field of environmental medicine. He has taught at Bastyr University, in Seattle, Washington, the National College of Naturopathic Medicine in Portland, Oregon, and the University of Bridgeport School of Naturopathic Medicine in Connecticut. Today, as Chief Science Officer of Enzymedica, he oversees research and development at the world’s leading nutritional enzyme laboratory and state-of-the-art enzyme producer. Dr Crinnion has served as the editor of the environmental medicine section of the journal, Alternative Medicine Review. He is the author of “Clean, Green, and Lean: Get Rid of the Toxins that Make you Fat” as well as over 25 articles in peer-review journals.” He is also a popular guest on American television and radio. “The reason most people take a multivitamin is to prevent or overcome nutrient deficiencies. 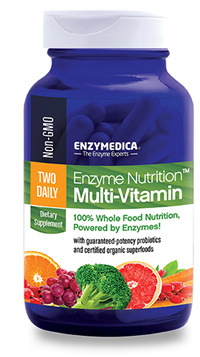 Enzymedica’s vitamins and minerals however, do not fit the definition of a supplement; we call them nutriments. That’s in stark contrast to most ordinary multivitamins whose nutrients largely pass through your body unabsorbed. And that’s why you can experience genuine health benefits from your very first capsules and actually feel the energy boost within minutes. The Enzyme Nutrition™ Multi-vitaminincludes 39 different nutrients, many of which you won’t find in typical multivitamins. But the breakthrough core of its power comes not only from this full range of premium-grade ingredients… but from the special, patented enzyme blend that helps your body absorb 99% of each nutrient. The Enzyme Nutrition™ Multi-vitamin has already changed the lives of tens of thousands of Americans, and it’s now available in the UK for the first time exclusively for readers of this special report. My regular readers know that I’m all for multivitamins. For as long as I’ve been researching natural medicine, I’ve advised everyone who will listen that the cornerstone of a healthy lifestyle is a top-notch, high-quality multivitamin. But there has been no shortage of detractors. Meanwhile, multivitamin advocates argue that the typical modern diet simply doesn’t meet the basic nutritional requirements. In fact, multiple studies reveal that significant vitamin and mineral deficiencies still plague large segments of our population, leading to low energy, fatigue, weak resistance against illness, foggy thinking and other problems. And these health-draining deficiencies crop up even among people who are “eating right” and living a healthy lifestyle. Over time, these deficiencies can lead to serious problems. I absolutely concede to the naysayers that the vast majority of multivitamins on the market today are mostly rubbish. Unfortunately, that includes some of the bestselling brands that you see lining the shelves at the supermarket and in health stores. The widespread popularity of these cheap, practically useless formulas is enough to tilt the results of any multivitamin study. These products reflect their price tags. For starters, they provide insufficient quantities of the beneficial ingredients. Worse, they use cheap synthetic isolates of each nutrient – the cheapest forms they can find, in fact – and are filled with binders, fillers, wax and artificial colours. As a result, your body doesn’t absorb them well. Your cells, muscles and tissues have to work hard to absorb a mere fraction of the nutrients in the supplement, if anything at all. The rest is completely wasted… and you experience few, if any health benefits. Sure – it’s a great deal for the manufacturers. They make a fortune on these products. But it’s a horrible deal for you, as “affordable” as they are. That’s why you can take a well-known multivitamin and still not notice any difference in the way you feel. While whole-food multivitamins are a huge improvement over the cheap synthetics, they still follow the same 80-year-old multivitamin blueprint: a variety of nutrients combined in a capsule. The Enzyme Nutrition™ Multi-vitamin breaks the mold – it shatters it – with its groundbreaking rapid-absorption technology that changes the multivitamin as we know it.